Donald Trump’s decision to join the summit in Warsaw immediately skyrocketed the young framework of the Three Seas Initiative, stirring new debates in regards to the region’s perspective, energy security and geopolitics. It was just one year ago, that I attended the ‘To Be Secure’ (2BS) Security Forum in Budva, Montenegro, where Croatia’s President, Kitarovic, gave an eye-opening speech announcing the foundation of a central and eastern European project that would encompass states between the Adriatic, Baltic and Black seas to cooperate in domains as energy, trade and infrastructure. It was around May 2016, that I’ve learned about the initiative, two months before the first summit would take place in Dubrovnik with little-to-no coverage in the international press. Many have thought that this would be a merely intra-European Union framework, similar to the Visegrad, others believed that the potential is limited due to the statistical reality of BABS (BABS: the region of Baltic – Adriatic – Black Sea), which accounts for 22% of the European Union’s population and only 10% of its GDP, stressing that economical prospects could only be long term, with low to none immediate effects, therefore lacking a true geopolitical posture. Nonetheless, there have been others that saw in the Three Seas Initiative an embodiment of the ‘Intermarium’, taking aside the fact that the Central and Eastern European (CEE) region has ceased to exist as a geopolitical entity after its integration into the European Union and NATO. But given the current Euro-Atlantic dynamic and the reconfiguration inside the European Union, which have proven that the organization is not a geopolitical monolith, the idea of an ‘Intermarium” might not be such far-fetched. Moreover, the strategic roles played by Poland and Romania in regards to Washington’s geopolitical strategy in Eastern Europe, complimented by a unique mutual compatibility are key elements of understanding the hypothesis of a modern day ‘Intermarium’. It was Jozef Piłsudski, the founder of the second Polish republic and the first chief of State, proposed the establishment of Międzymorze (‘between seas’ in English, and Intermarium in Latin), a federation of people and states under the aegis of Poland, located between the Baltic and Black Sea, in order to serve as a counter-weight to both Russia, later Soviet Union and to Germany, and posibily to emerge as a regional power itself. In many ways, the initial project actually planned to resurrect the former Polish-Lithuanian Commonwealth, prospecting the territory of the modern day Baltic States, Lithuania, Belarus and parts of Ukraine through the strategy of Prometheism, intended to dismember and weaken the Russian Empire by aiding nationalist movements of non-Russian people inside the empire. While Russian and Germany both opposed the plan, France, who was an active planner of the European security architecture at that time, supported it, duly because it would have blocked two brands of imperialists entities, while not creating a third one; Paris didn’t believed that Intermarium could have become an empire on its own, as neither the Polish-Lithuanian Commonwealth was ever perceived as one by historians and politicians. Some may say that the Poland that preceded the Great War was faced with a different geopolitical configuration, bordering two revisionist empires and lacking a consistent committed partnership with an outside power. However, Intermarium, aside from the geographical determinism, is not a fixed term but quite a flexible idea. If in the early 1900’s it meant a federation of states, in the 21st Century it could potentiate a regional alliance ramified in the security, energy and economic sectors. In today’s security environment, the CEE is the most stable region of Europe, sheltered from terrorist attacks due to its societal make-up and due to the lack of interest from mainstream terror groups, but also protected by Russia’s resurgence through the NATO membership. Furthermore, the CEE states are both members of the European Union and the conservative-minded members of the block, some even sharing Visegrad membership, deconstructing the the false impression that the European Union is a cohesive monolith. In many ways, the east-west contrast within the European Union is clear yet asymmetric, disagreements and gaps exist on major topics such as energy, migration, Russia and nowadays, the United States. Therefore, the current geopolitical context of the CEE is intertwined with the Anglo-Saxon security architecture in Europe, perpetuated by America’s direct involvement in the defense and well being of these states. CEE have one existential fear, the threat from Russia, felt differently and ignored on the western or southern coast of Europe, but best understood across the Atlantic, in Washington, or beyond the canal, in London. ‘Poland is the most pro-American country in the world — including the United States’ Michael Mandelbaum, a professor emeritus at Johns Hopkins University and foreign policy expert said after visiting Poland. ‘Romania is the most pro-American country in the EU. Over 70 percent of Romanians, this is what polls show, have a positive sentiment towards the US and this is transposed in concrete actions,’ Romanian President Klaus Iohannis said at the Heritage Foundation on June 8th, when he was the first head of state from a CEE state to visit Donald J. Trump. Both statements reflect a reality founded on America’s fight against Communism and its later unconditional support against Russia, thus enabling Washington to base its Eastern European security architecture on Romania and Poland. The embodiment and triumph of this stable, predictable and harmonious strategy is the Aegies Ashore anti-ballistic system, built by the United States to protect the western hemisphere by short-to-medium range missiles coming from hostile threats, part of the Phased Adaptive Approach launched in 2009 by the Obama administration based on a plan theorized by the Bush administration before. First Phase, Aegies equipped Navy ships operating out of Rota, Spain to be deployed in the Mediterranean Sea, conducting operational readiness. Second Phase, building the Aegies Ashore Missile Defense Facility in Deveselu, Romania, consisting of a deckhouse, a battery of Rayton SM-3 anti-ballistic missiles, capable of shooting down targets flying as high as the low Earth orbit. Manned by a crew of military and civilian personnel from the U.S. Navy, the state of the arte infrastructure became operational in 2016. Third and Last Phase, building another Aegies Ashore Missile Defense Facility in Redzikowo Base in Gima Shupsk, Poland, which will be operational in 2018. Durring the NATO Summit at Warsaw, the United States transferred the Aegies Ashore facility under the NATO anti-missile shield system. This infrastructure is capable to track, identify (in an early warning stage) and destroy a warhead or any potential weapons of mass destruction that a ballistic missile may carry. Of course this system degraded Russia’s airspace and ballistic superiority over its eastern neighborhoods and dramatically reconfigured the geostrategic game in favor of NATO. Before Romania and Poland joined NATO, the United States approached them for signing strategic partnerships. Throughout this framework significant relations have been developed in a variety of sectors, but primarily in regards of defense and military cooperation. The United States established a series of bases in Romania and Poland, providing for a permanent-rotational presence to assure its new partners of a perpetual commitment, while Romania and Poland host Washington’s assets, giving them an edge towards Russia and the East. It is one of the very rare win-win geopolitical deals..
For example, Romania hosts U.S. Army personnel at the Air Base in Mihail Kogalniceanul, located on the coastal region near Babadag with an immediate opening to the Black Sea. In addition, there is also a strong presence at the Campia Turzii Air Base in Cluj. Also, worth to mention is that even the Aegies Ashore system was planned and built within the framework of the Romanian-US strategic partnership. In addition, Romania’s main issue, corruption, is dealt with in the context of US-Romanian cooperation, as in the beginning of the 2000’s, Washington sent FBI and DEA experts to modernize and provide expertise for the National Anti-Corruption Directorate (Directia Nationala anti-Coruptie/ DNA), while also reforming the Romanian Intelligence Service in a top brass, becoming an intelligence and security exporter throughout the North-Atlantic community. Moreover, both Poland and Romania have chosen US companies to modernize their defense capability in regards to ground, naval and air assets. Just recently, Romania finished receiving a fleet of F-16’s while further purchases, such as a second squadron of fighters jets, corvettes, Patriot system and armored infantry vehicles, are on the line. However, due to economic and political superiority, Poland managed to modernize its armed forces much more quickly and are advancing to higher acquisitions. In the context of Russia’s annexation of Crimea and the perpetual hybrid warfare conducted against Ukraine in Donbas and Luhansk, the Eastern Flank has regained a strategic position on NATO’s agenda. Starting with the Wales Summit in 2014, organized solely because of Russia’s aggressive resurgence, allies have agreed to boost military exercises, increase U.S. troops and hardware to Europe, raise defense expenditure at 2%, but also to boost the Rapid Response Force by creating a Very-High Readiness Joint Task Force (VJTF)/ ‘Spearhead Force’ consisting of 20,000 soldiers (5,000 infantry) ready to ‘plug-and-fight’ in at least 48 hours, critical for responding to emergencies and spontaneous hostile intrusions. In regards to the VJTF, NATO also built integration units in Estonia, Latvia, Lithuania, Poland, Hungary and Romania, where these troops would be sharply deployed and equipped if duty calls. In addition, two superior headquarters were established to coordinate all of them, of course, the Multinational Corps Northeast was placed in Szczecin, Poland while the Multinational Division Southeast in Bucharest, Romania. Building upon the Readiness Action Plan, during the NATO Summit in Warsaw (2016), allies agreed on the Enhanced Forward Presence. The plan foresees the creation of four robust and combat-ready multinational battlegroups to be placed in Estonia, Latvia, Lithuania and Poland, each one of them led by the United Kingdom, Germany, Canada and the United States. While these battlegroups reflect the strength of the Transatlantic bond and prove that an attack on one is clearly an attack on all, these arrangements also suggest certain bilateral sympathies and closer links between some states. For example, the battlegroup for Poland is of course led by the United States, and is composed of US, British and Romanian forces, hosted by Polish forces in Orzysz (Bemowo Piskie), Poland, being also the strongest battlegroup, encompassing 1270 soldiers. Romania has not received a battlegroup in this framework, solely because its objective at the Summit was naval-focused, wanting, together with Turkey to create a Black Sea Fleet initiative in the Black Sea, to which Bulgaria expressed opposition to. However, a tailored presence will be established in Romania, by turning Romania’s 2nd Infantry Brigade ‘Rovine’ based in Craiova into a multinational one, unsurprisingly joined by U.S. and Polish forces, but also by Bulgarian and German (logistics only) personnel. This 5th multinational brigade will be operational in 2018. We can conclude on this chapter that all of the NATO projects and initiative adopted in the past three years have one common trait: the American-Romanian-Polish trio. Nonetheless, the Enhanced Forward Presence is part of the larger Deterrence and Assurance strategy adopted by NATO in the eve of Russia’s annexation of Crimea. This strategy implies moving troops and hardware on allied territory to assure them of commitments, but also to deter possible hostile incursions. Throughout this strategy, the United States is also providing air policing to the airspace of CEE countries threatened by Russia’s air bullying. However, there is one vulnerability to which CEE nations and most of the European states are exposed when thinking about Russia, and that is energy. An untraditional non-military threat, serving as a soft power component of the Kremlin’s toolkit, Gazprom exports gas to almost all European states, and it is the main supplier to the majority of them, including the CEE ones. According to Eurogas, Lithuania, Estonia, Finland, Latvia, Bulgaria, Slovakia, Hungary, Slovenia, Austria, Poland, the Czech Republic and Greece, but also Germany and Italy import most of their natural gas from Russia, both in comparison with other sources and in volume. The European Union had several attempts to reduce the dependency on Russian gas by diversifying suppliers and energy sources, by moving towards renewable energy (very long term, inaccessible to most of staes), shaping new energy trade relations, as with Azerbaijan (TANAP and Nabucco) or Qatar (LNG) and the U.S.(LNG and Shell). However, the dream of moving towards energy independence has been shattered by the repeated failures of fulfilling these projects, and dramatically succumbed by the North Stream 2 pipeline, that would increase and consolidate Russia’s monopoly on the market with German acceptance. North Stream 2 is a pipeline that would provide natural gas from Russia’s Ust-Luga port to Germany’s Greifswald port, traversing the Baltic Sea. In April 2017, Nord Stream 2 AG signed the financing agreements for the Nord Stream 2 gas pipeline project with ENGIE, OMV, Royal Dutch Shell, Uniper, and Wintershall. These five European energy companies will provide long-term financing for 50 per cent of the total cost of the project, while the other half will be provided by Gazprom, consequently being the biggest sole stakeholder. Poland was a leading opposition voice to this project, even forwarding a complain to the European Commission, highlighting that the project does not only violate the European Exclusive Economic zone, but that it also ignores the sanctions imposed against Russia, subsequently threatening Europe’s energy security. However, on March 2017, the European Commission abandoned any plans to block the pipeline, stressing that they lack the necessary legal grounds. United States came to the help, when the Trump administration and the Senate proposed a new wave of sanctions against Russia, which would have also damaged the North Stream 2 pipeline. Germany and Austria condemned the proposed expansion of U.S. sanctions on Russia, saying the measures sought to bolster U.S. economic interests and included an unacceptable intervention in the region’s energy sector. Of course we shouldn’t approach the issue from a matter of idealism, but through the lens of realism and how states also perceive each other’s movements. Germany is the main export market for Gazprom, the Kremlin cannot have a submissive approach towards Berlin, as it can have towards Warsaw, because losing its main customer will be a massive blow to Gazprom’s capacity and Russia’s economy, but the relation with Warsaw, Talinn and Riga, are in a stark contrast because they do not have any economic leverage over the Russian Federation. In accordance to the United State energy global strategy, that of becoming an exporter, through liquefied gas (LNG), and based on the strong alliances with CEE states, the United States quickly came with an alternative to Russian gas, which is the American LNG. The American LNG faced strong opposition through the European Union dully because that would erode Russia’s main gas markets, and also weaken Berlin’s privileged energy relations with Russia, ramified in significant discounts and moderately-good diplomatic channels. This can be also perceived from a geopolitical framework, where the main European states have began moving away from the Transatlantic partnership in order to craft a continentalist euro-centric vision, that of a strong sovereign Europe with an own army and a independent energy policy. CEE states look at the European Army with rising skepticism, notably because that could imply distancing from NATO and the U.S., which is not in Poland’s, Romania’s or the Baltic State’s interests. Correlating with Donald Trump’s ascension into the White House, in Western Europe a significant ‘anti-Trump narrative’ emerged, which is notably dangerous because it could actually be, or become, a banner/ a front for a discrete ‘anti-Americanism’, an element deemed useful for catalyzing a Euro-Atlantic split. From an informational warfare stand point, it is possible that Kremlin fuels this narrative, through deception and reversed-propaganda. I want to quote ex-Special Operator from the 75th Ranger Regiment when he said on his private Facebook account, that Russia’s information warfare is more bizarre and sophisticated than most people understand, and that the information sector is one battlespace that we are losing in face of Moscow’s offensive. It is useful for the Kremlin to associate Trump with Russia, even through ‘useful’ unintended intermediaries as some press outlets in the United States and Europe, as long as that creates a gap between the European Union and the United States. Russia’s only strategic leverage left above Europe is gas, and America’s energy exporter vision is the direct threat it faces right now. In face of this Brussels-Washington disengagement, the CEE states are worried and cautious at the same time, they depend on the capable and superior U.S. military to deter Russia, and they desperately need energy alternative to assure their sovereignty, while European states, more geographically close and economically intertwined with them, are showing a trend of distancing from Washington and appeasing Moscow. Based on this, the CEE states had no other choice that to sketch their own block. 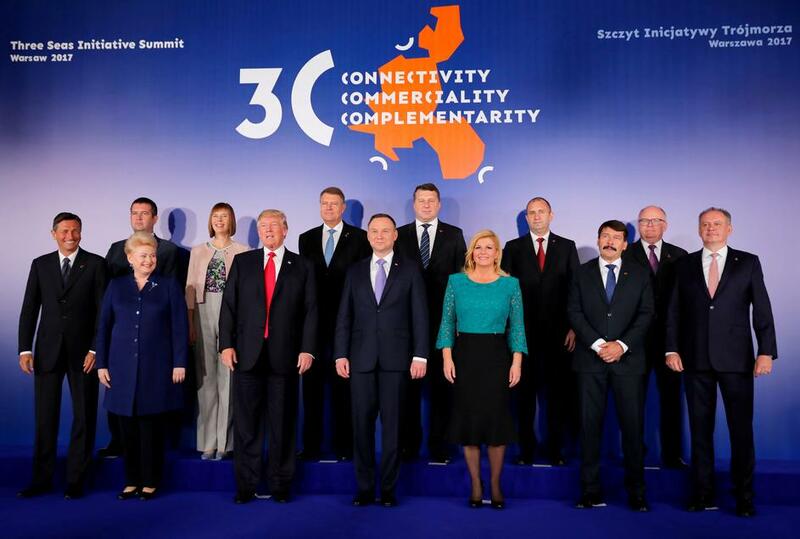 The Three Seas Initiative is a joint Polish-Croatian project, launched in 2016, with the aim of strengthening trade, infrastructure, energy and political co-operation among countries bordering the Adriatic, the Baltic and the Black Sea. Composed of 12 members, Poland, Hungary, Czech Republic, Slovakia, Romania, Bulgaria, Lithuania, Estonia, Latvia, Croatia, Slovenia and Austria, the framework will bost LNG imports from the U.S. in Europe. Poland has already completed building an LNG terminal on the Baltic coast, and eyes to become a regional transitional hub for energy, reflected by Croatia, expected to complete its own terminal in 2019. Another pillar is the construction of a Via Carpatia highway that will connect Lithuania’s port of Klaipeda with Thessaloniki in Greece, passing through eastern Poland, Slovakia, Hungary, Romania and Bulgaria. As things stand, the CEE states lack connecting infrastructure as express roads, highways or modern railroads, while flights are at a minimum level. The region’s overall economic capacity is the lowest in the European Union and its development on other sectors as military and innovation is far behind other leading states from the organization. However, the Three Seas Initiative is exactly the kind of catalyst that would serve as a launching pad for the rise of this region. And the importance of the initiative is notably underlined by Donald Trump’s surprise visit to the Summit in Warsaw, where he delivered a historical speech attended by thousands of Poles gathered in the Krasinski Square, acknowledging the region’s tumulus history under brutal Communist dictatorships but also its devotion to freedom and liberty shown by the heroic revolutions of the ’89. In addition, it pledge all of the support for this initiative, while also called on ‘Russia to cease its destabilizing activities in Ukraine and elsewhere, and its support for hostile regimes — including Syria and Iran — and to instead join the community of responsible nations in our fight against common enemies and in defense of civilization itself’. “This is a truly transatlantic project that has enormous geopolitical, geostrategic, and geo-economic ramifications,” said Jones, who served as national security advisor in the Obama administration. Consequently, he contended, “we need to cultivate the new American administration’s interest.” By strengthening the Three Seas region, and by extension all of Europe, the initiative will strengthen the entire transatlantic community, he said. Therefore, an ‘Intermarium’ might not be an anti-EU project that some may believe or even expect, but a solidification of the CEE posture within it, that would not only strengthen the plurality of political stances within the European Union, but also transform it for the better. A major flaw is that Poland and Romania do not have a mutual strategic partnership, the bilateral relation is at an average level, far weaker than the dialogue Warsaw entertains with Zagreb, for example. There is also a divergence problem, not all CEE states see eye to eye on U.S.-Russia relations, for example, the Czech Republic, Austria or even Hungary have expressed significant sympathies towards the Russian Federation, and do host strategic non-military assets of the Kremlin, as the Czech Russian Bank (Czechia) or the upcoming 2019 the Central European connector pipeline of Turkish Stream (Hungary). Under-investments and an overall weak economic power of the CEE region. The Tree Seas Initiative is dependent on external support, such as from the U.S. to emerge as a major player in the European dynamic. The next Three Seas Initiative Summit will take place in Bucharest, Romania. While this organization is currently focused on energy and infrastructure, in the eve of a pan-European military project that would distance from the U.S., the Three Seas Initiative could develop its own military and political aspects and remain firmly anchored with the Anglo-Saxon community, while not necessarily alienating itself from the European Union. Be advised, these are complex and ambiguous geopolitical platonic shifts, we could witnesses and see confirmation only over a timeline of years, depending on dozens if not hundreds of inputs and trends, black swans or predictable developments. What this analysis intended to do is to put on paper a recurring and impossible to ignore tendency, of a growing CEE alignment with the US as a direct reaction to the E.U’s core dangerous stance on sensitive issues as energy and Russia. ‘Intermarium’ could be one of those consequences; some already say that the Three Seas Initiative is the exact embodiment of that concept. Although, it seems that the perpetuation of this trends has become a priority for the Trump administration being also catalyzed by the developments inside the European Union put in a start anti-thesis with the political and strategic landscape of Central and Eastern Europe, therefore we have reasons to acknowledge the ascending nature of this trend. Richard Woytak, The Promethean Movement in Interwar Poland, East European Quarterly, vol. 13, no. 3 , 1984, pp. 273–78. Tom Lansford, Blagovest Tashev, Old Europe, new Europe and the US: Renegotiating Transatlantic Security in The Post 9/11 Era, Ashgate Publishing, 2005, pp. 216.